Halloween: The scariest spook houses are dark with lots of hovering fog. 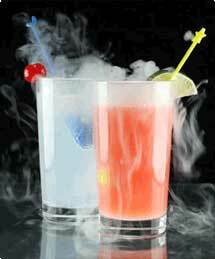 Use Penguin Brand Dry Ice to create fog by placing a few cups of hot water into a plastic or metal cauldron. Add a few small pieces of dry ice to create instant fog. Add dry ice as needed. Use a crock pot or hot plate to keep water warm. Witches brew is extra scary when dry ice is added. The mysterious bubbling seems like boiling frogs stew rather than punch. Your guests will love the punch and the special effect. Use 1 gallon of red grape juice and 1 gallon of extra pulp orange juice (refrigerate both juices prior to use). Mix together and add a few small pieces of dry ice when ready for the bubbling effect. 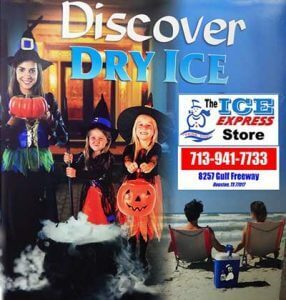 Do not serve dry ice to your guests. Mix together 1 can of red grape juice and 1 can of pineapple juice. Just before serving, add 2-3 pounds of Penguin Brand Dry ice to create scary bubbles and fog. For best results, use small pieces of dry ice and add to punch at room temperature. Serve the punch without dry ice. Swizzle Stinks Available at Ice Express in Houston.